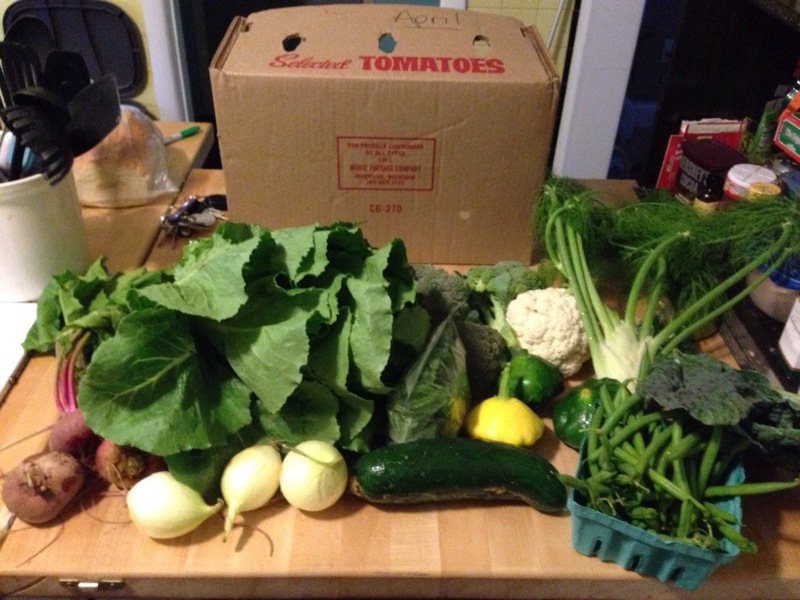 This past week, we were so busy that we even forgot to pick up our CSA on Tuesday; we ended up getting it a day late. Thank goodness for patient farmers 🙂 I’ve been doing what I can to process as I go, but I also put in a lot of hours at the bakery so I still have quite a bit to do tonight before school tomorrow. I think I’m ready for it. It will be nice to get back into a routine of sorts! two heads of lettuce – Salads for lunch – no matter what! jalapeno peppers – I think a can of pickled jalapenos is finally in order! potatoes – Just the right amount for potato salad on Labor Day! eggplant – I have some Indian and Moroccan meal-makers in my pantry…this may be a great *quick* dish for yoga night. parsley – I’ll be making chimichurri to freeze. One week left of true summer break…teacher workdays are next week! Where has the summer gone? I think it’s safe to say, however, that I am starting to look forward to it. – beets…it must be one of those years for beets! 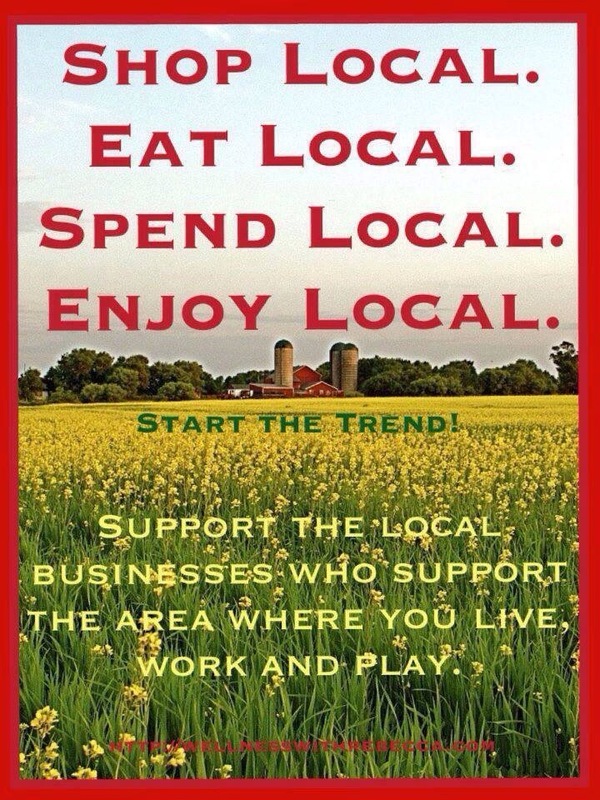 So far this week, I’ve purchased peaches, burger, and eggs at the market. Any suggestions out there for beets!? Even with the batch of beet beer, we still have a bagful. Help! – 3 heads of lettuce – Lots of salads need to be consumed…you’d think this would be easy. 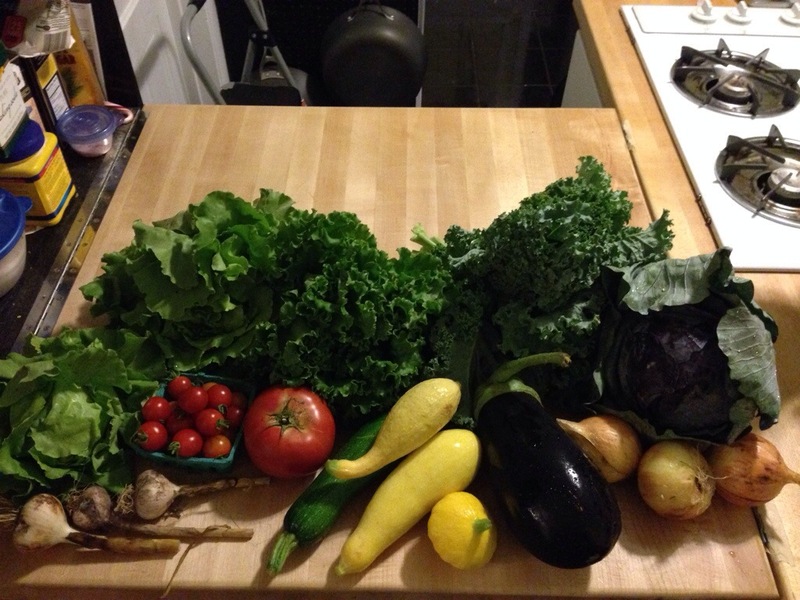 – summer squash – we received one of every variety, so maybe I’ll bake? – red cabbage – Both of my cabbages have been quartered & cored, washed, vacuumed-sealed and frozen. This works great for soups, stews and other recipes during the winter! If only I had a crock, I’d try making sauerkraut! – onions – I’m starting to get a surplus. Either a jar of pickled onions is in order, or I just need to cook more. 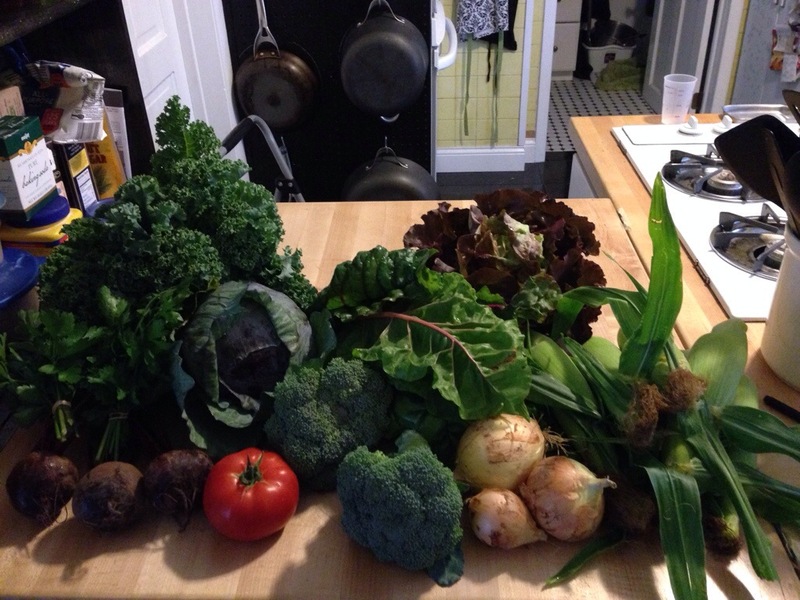 Any fun plans with your CSA share this week? What an exciting week in CSA-land! Temperatures up here are starting to creep up, which means that more variety is on its way. Vegetables are finally starting to grow! In our own garden, we harvested a gallon-sized Ziploc bag of peas, and a gallon plus a half of green beans. With more to come! Tonight the game plan is to cut up the green beans and throw them in the deep freeze. We also harvested our first tomatoes…now if we can just keep the weeds down, we’ll be in business. 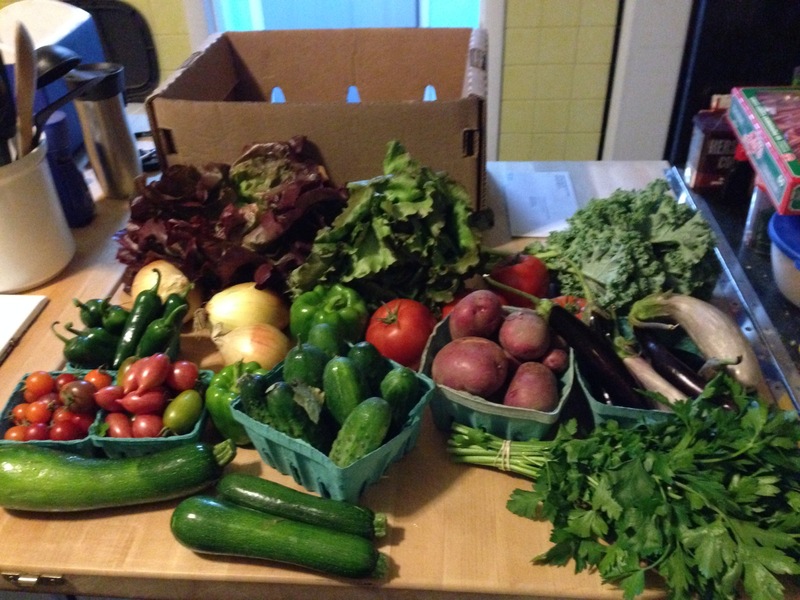 My husband and I celebrated our anniversary this past weekend and went out to eat a little too much – so I still have a significant amount of produce to go through before our next box on Tuesday. Thankfully, I have Monday off and Tuesday morning to tackle the bounty and get ready for even more fresh produce! 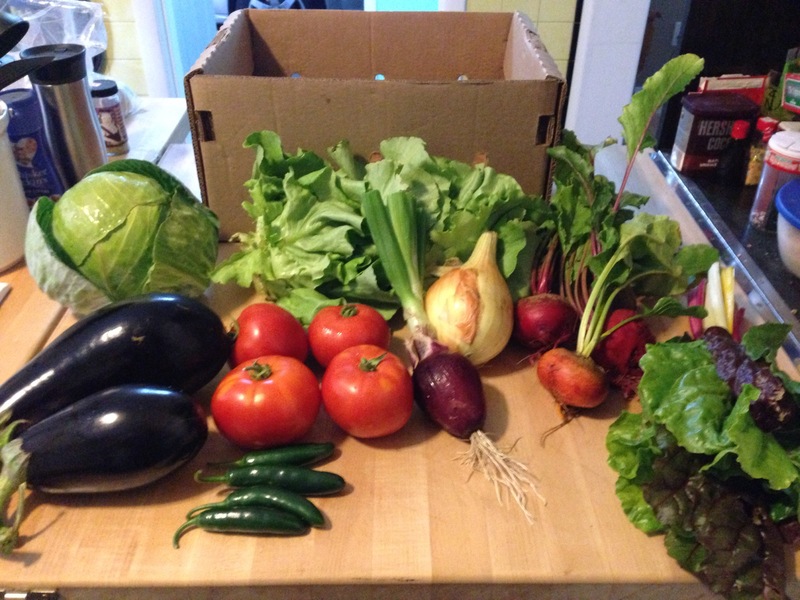 …though despite the weather, our CSA share this week was plentiful nonetheless! – lacinato kale – We’ve already eaten this…sautéed with olive oil and garlic, yum!